If you’re the type of person who loves wearing earrings, then you know how much tempting it is to buy every pair you see and love! This will probably cost us too much, but fortunately, there is a cheap way to get something even better, and that is the DIY way. 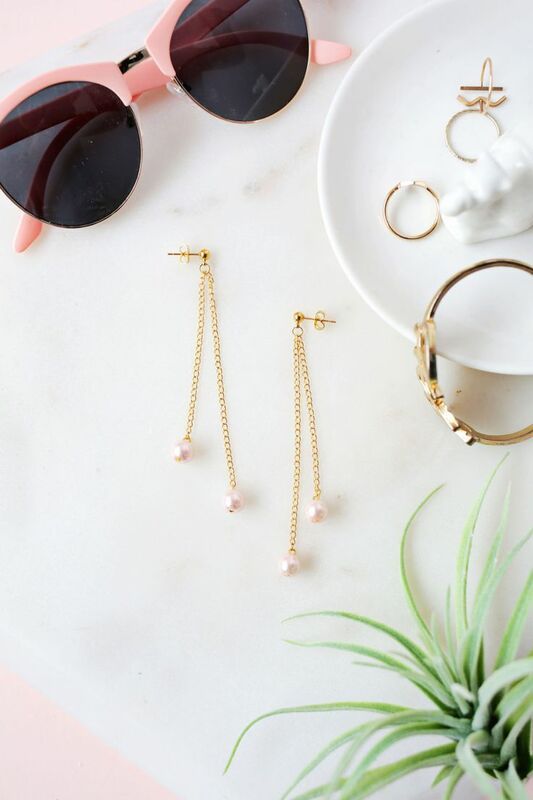 No matter if you like pearls, beads, studs, glitter or feathers, you can come up with your own pair of brand new earrings in such a short time for a small amount of money. 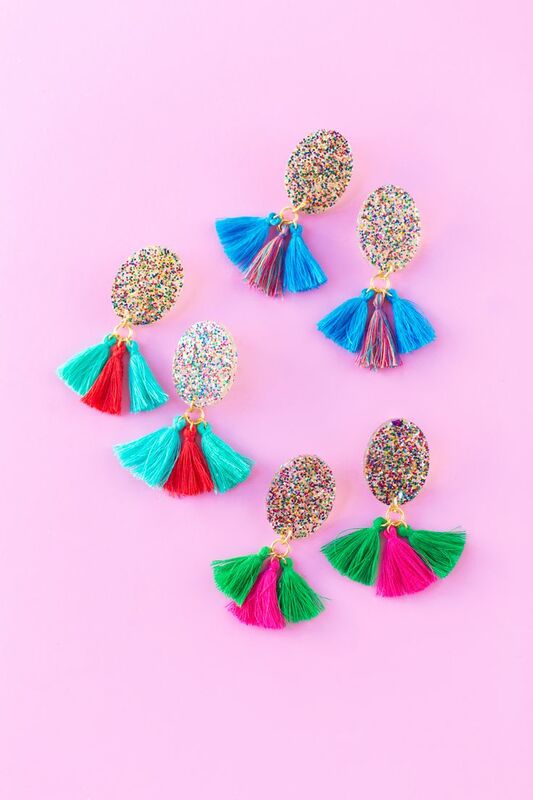 All you need is a little bit of creativity and we can even help you with that – scroll down below to see these gorgeous DIY earrings and find your new favorites! These pearl dangle earrings are the kind you need on daily basis – they look simple, yet so elegant. You can wear these with almost everything and they will still fit the outfit. To make your own pearl dangle earrings, you need jump rings, jewelry head pins, link chain, jewelry side cutters, needle nose pliers, and round nose pliers, ball earring posts and 8mm pink pearl beads. If you’re more into stud earrings, then these are the type of earrings you definitely need to have. The best part is that you choose what kind of color you want them to be, and also because of their simplicity, you can wear them on any occasion! To make these stud earrings at home, you need 6 x 4mm oval snap set post earring mounts, 6 x 4mm clear oval gems, nail polish or paint, and Mod Podge Sealer. Summer is just around the corner, so why not bring some fruity summer vibes into your accessories as well? One good way to achieve this is by creating your very own pair of beaded fruit earrings! 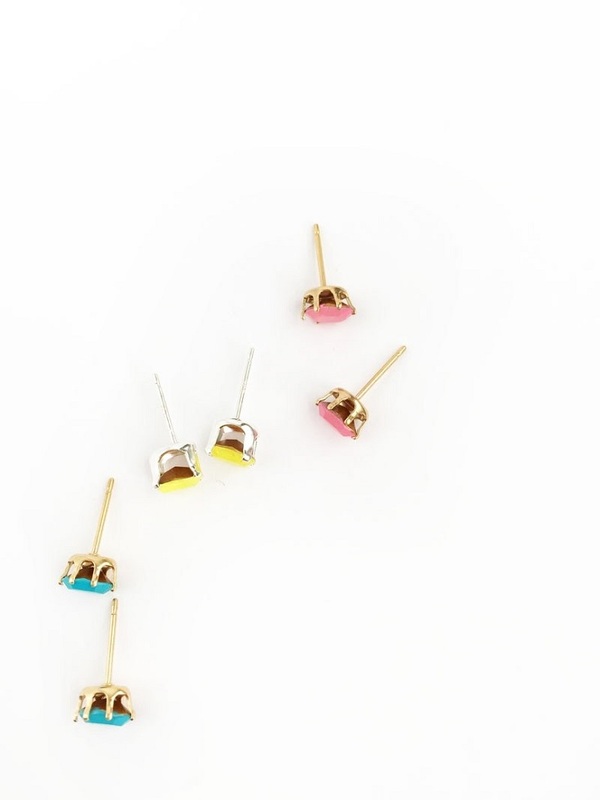 They’re brightly colored, small and cute and they will surely brighten up your outfit too. Make sure you have colored seed beads, small 1/2″ wooden beads, green tear drop beads, fishing twine, metal headpins, metal fish hook earring wires, spool of thread, jewelry glue and small jewelry pliers. 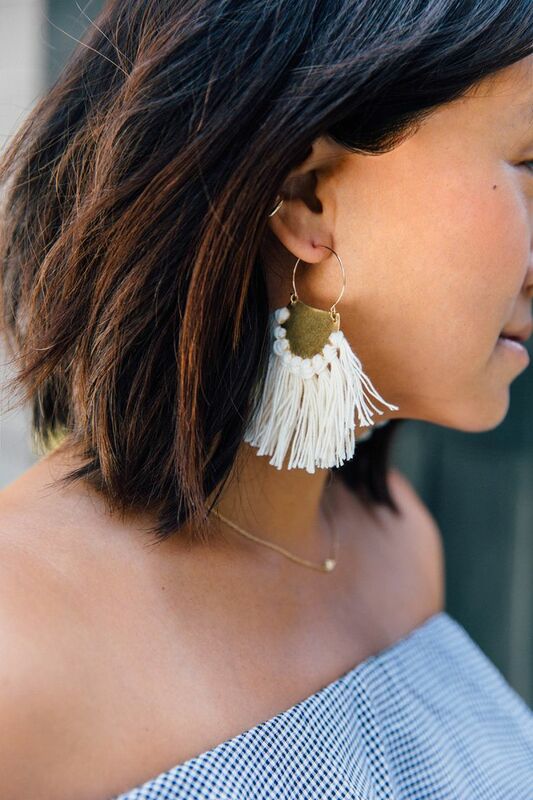 In the past few seasons, we’ve seen the rise of tassel earrings and apparently they’re here to stay. 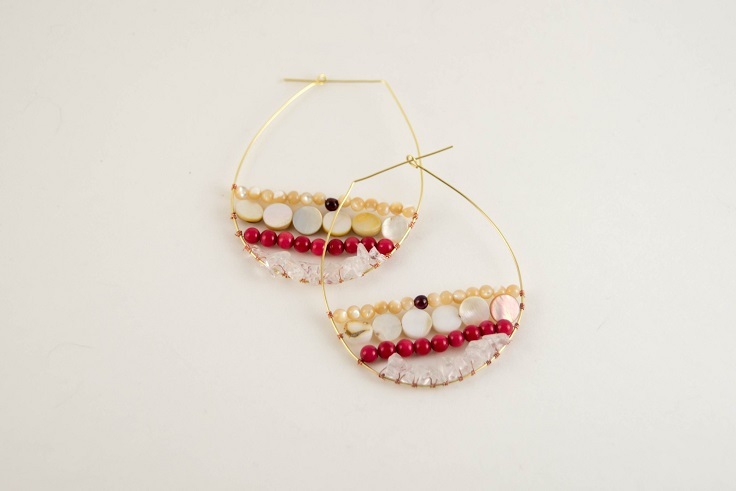 We don’t mind this at all because they look gorgeous and are definitely the pair of earrings you need for a night out. It might seem like a lot of work, but these are actually very easy to make. You need jewelry tools, craft casting epoxy, silicon jewelry mold, jewelry glue, two flat post earrings pieces, two earring backs, glitter, 7mm-9mm jump rings, and tassels. Similar to the previous earrings, but with more of a boho touch, we can say for sure that these are definitely our new favorite earrings. They perfectly would fit summer dresses and will make us look so chic! To make a pair of these at home, you need 2 1.25″ brass discs, 2 20mm gold filled hoops, 4 4mm gold filled jump rings, 1 big eye threading needle, metal hole punch, metal shears, embroidery floss, emory board, and a sharpie or permanent marker. 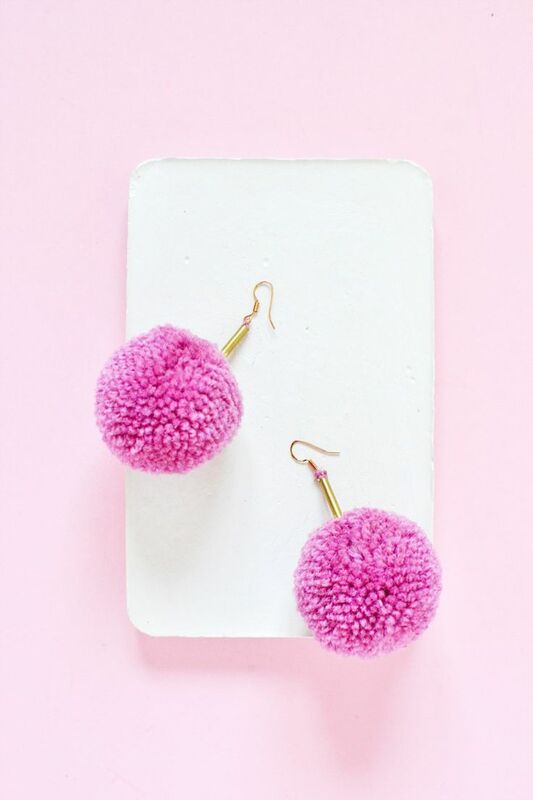 For every pom poms fan – here are earrings for you! 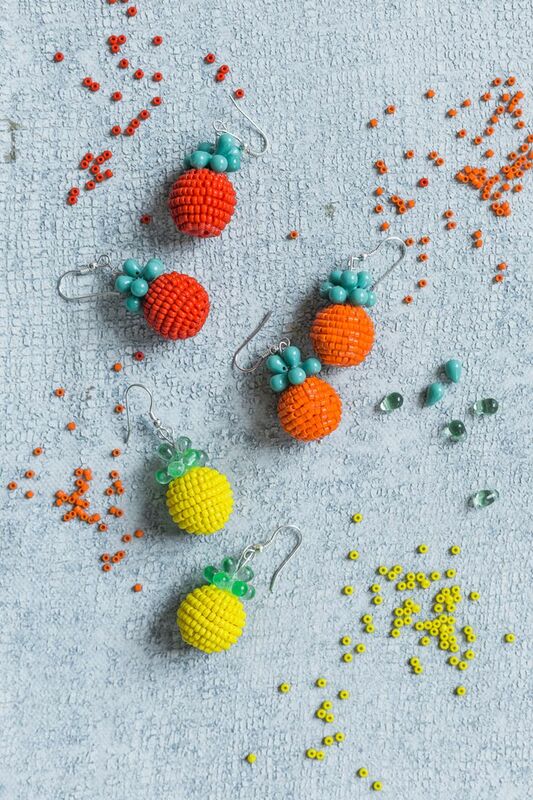 These tiny earrings are probably one of the cutest you’ve ever seen, and if by any chance you are a DIY fellow that loves projects with yarn, then this is something you’d really enjoy creating. You need yarn of your choice, pom pom maker, tube cutter, brass tube, X-acto knife, wide-eyed needle, rarring hooks, and pliers. And we’re back to the pearls! They look really elegant, which makes them such desirable jewelry. 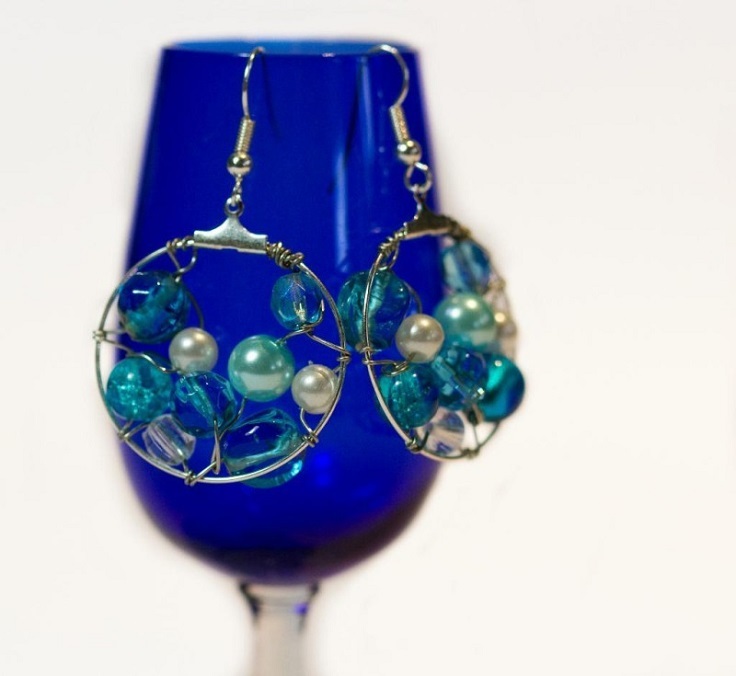 This time the earrings are a different style – pearls with blue glass beads. They are the perfect earrings you’d love wearing on the beach! To make your own, here’s what you need to get – 2x ear hooks, 2x earring hoops, 2x 20cm – 24 gauge silver wire, 2x assortment of blue glass beads and pearls, wire cutters and chain nose pliers. Beads are fun to create with! They come in so many different colors and shapes, which leaves us with plenty of ideas on how to create our perfect earrings. For this, all we need is just a little bit of imagination and creativity, so let it all out and have fun! Make your own beaded earrings by using these stuff – 1 spool 22-gauge gold brass wire, 1 spool 28-gauge copper wire, round nose pliers, wire snips and of course, your favorite beads. 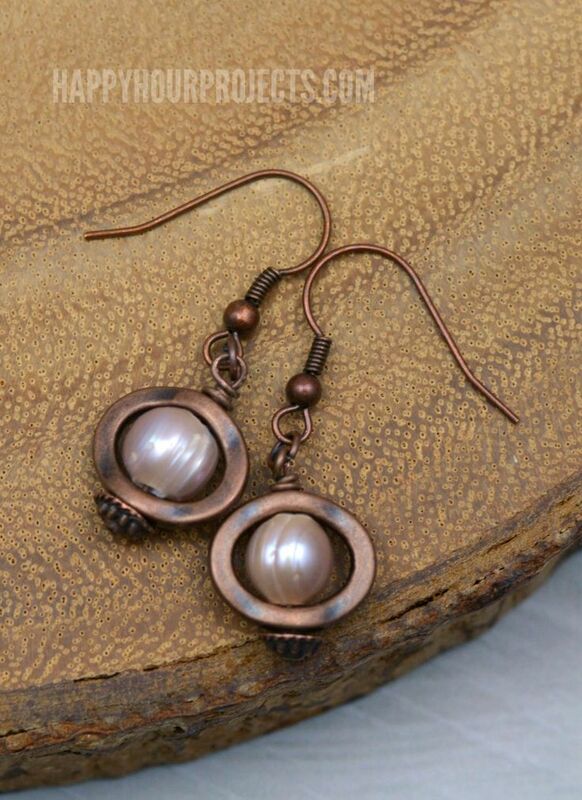 Copper and pearl is a combination worth wearing and you’ll be surprised at how easy are these earrings to create at home. It’s a fun project that can end up as the ideal gift for a beloved person! But first, get what you need – 2 – 4mm coordinated jump rings, round nose pliers, chain nose pliers, flush cutters, 2 – 9mm pearl beads, 2 – 14mm copper pewter oval beads, 2 – 52mm copper headpins, 2 – antiqued copper finish earring wires. Here’s another pair of boho earrings. 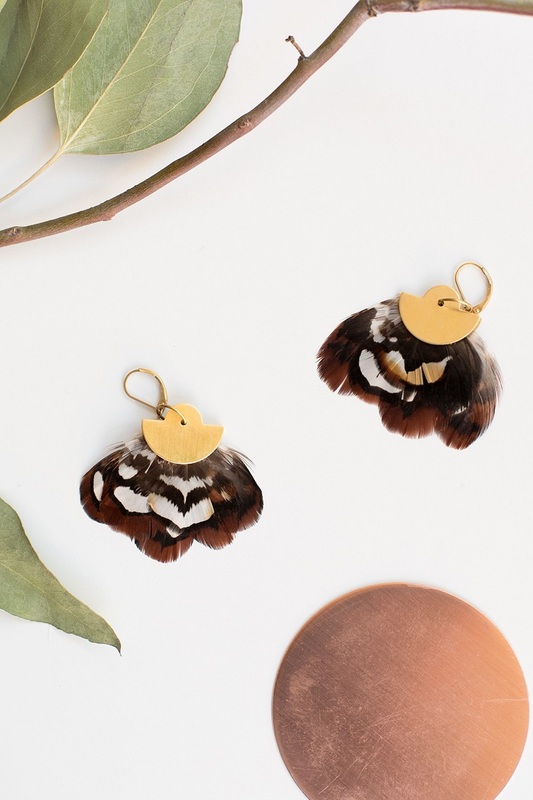 These are very unique and if you happen to be a person who likes feather earrings, these are definitely the right one for you. It’s the perfect way to boost your creativity and to get something new for you! Also, these earrings are budget-friendly and will be ready to wear in no time. You need gel super glue, brass blanks or ribbon crimps, earrings findings, and feathers.